It was so nice to see them open today; I missed their opening, but had heard. I didn't know that Wednesdays are their 10% Senior Discount Day now, so I was happy about that. 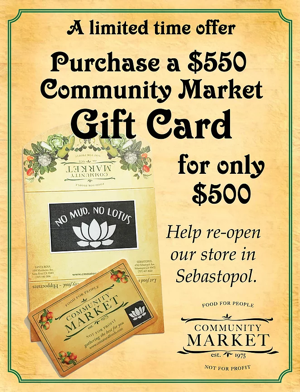 They are also offering Gift Cards worth $550, for only $500. They ask that you wait until June to start using them, but it helps them build up their inventory. If you can help out that way, great! Also, their produce dept. looked well-stocked and very fresh. Good Luck to everyone in the Barlow. Last edited by Barry; 04-04-2019 at 11:12 AM. « (Previous Thread) Sonoma County is banning hemp production!?!? !